DETROIT (CNS) — The bell tolled 44 times. One time for every name that was read. They were brothers and sisters, fathers and uncles, young and old. Whether they were “looters” or “bystanders,” 50 years later, they were people gone, but not forgotten. On July 23, Christ the King Parish and others in northwest Detroit commemorated the 50th anniversary of the 1967 riot — some in the community call it the 1967 rebellion. Whatever semantics people choose, 44 souls were lost in its aftermath. And 50 years later, parishioners — black and white — came together to remember the dead. The Mass featured testimonials from parishioners who lived in the area, recalling their limited perspective on a day that shook the city to its core. Archbishop Allen H. Vigneron, in a letter to the faithful of the Archdiocese of Detroit, called on Catholics to “lift our city, our region and one another in prayer” in remembering the events. In helping break down cultural barriers, Archbishop Vigneron urged participation in the July 31-Aug. 5 Life Remodeled neighborhood cleanup project in the neighborhood where the violence began. Parishioner Clara Rich recalled what the social scene was like in Detroit before the riot, saying tensions between the white and black communities were present with rise of the civil rights movement. But she also recalled a moment of hope in the community, when the Jesus statue outside Sacred Heart Seminary was painted black, a reflection of the surrounding community. 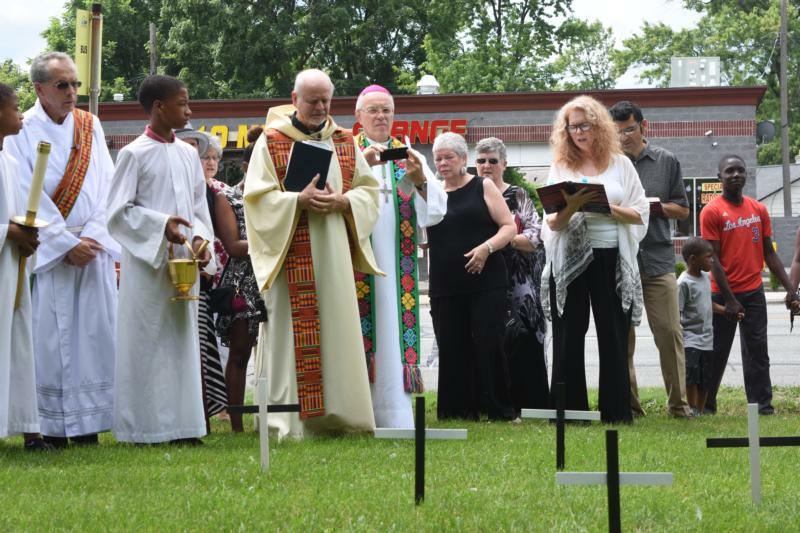 After Mass, Christ the King’s pastor, Father Victor Clore, led the congregation to the parish’s front lawn, where 44 black and white crosses were planted, representing the victims of the violence.